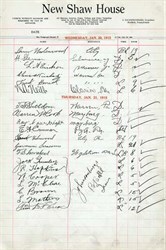 One completed register page,front and back, from the New Shaw House located in Sheffield, Pennsylvania dated 1915. The paged has the guests signature, residence and time checked in and room number. The proprietor of the hotel was J. Baldensperger.